With its beautiful setting, historic mission, comfortable climate, and quaint downtown, what keeps San Luis Obispo from becoming just another haven for retirees? 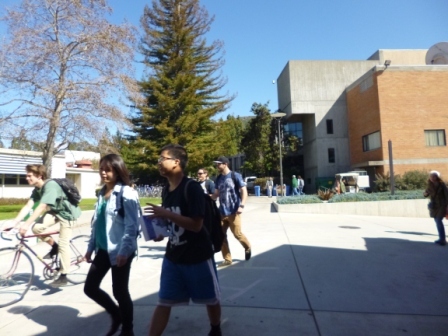 The gods, in the form of the California State University regents, have gifted SLO with the Californial Polytechnical State University, the queen campus of the State University system, affectionately known as Cal Poly. An easy bike ride away from downtown, the campus radiates enough life force to keep the aterioscelerosis from building up behind those 100-year-old storefronts. 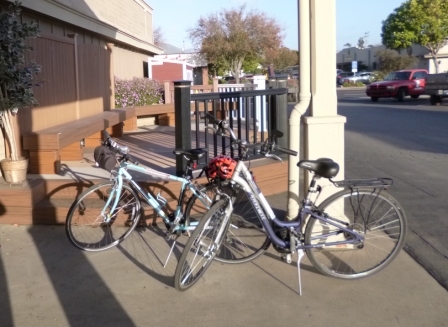 The next morning we pedal through the craftsman shingle or stucco bungalows of SLO up to the campus. For those accustomed to the pseudo-mission sandstone and tile roofs of Stanford, UC Berkeley, and San Jose State, or the pseudo-Gothic granite of the Ivy League and Duke, Cal Poly is a shock – all modern techno-architecture accented with corrugated siding and solar panels, suitable for the generation that buys its efficient minimalist furniture from IKEA rather than from thrift stores. We parked our bikes and began to explore. We cross wiry suspension bridges between the buildings, dodging construction sites, and gradually move toward the campus center along with a stream of students – it is nearly lunchtime. The dining commons features every student’s basic fare: pizza, hamburgers, Chinese take-out, sandwiches, plus a salad bar for visiting parents. The bookstore sells a wide variety of Mustang-logo’d apparel, and also sells postcards (for non-visiting parents?) There is a band playing in the plaza. A housing fair is happening on the lawn. A student spots us consulting our campus map and asks if she can help us find something. It’s that kind of place. 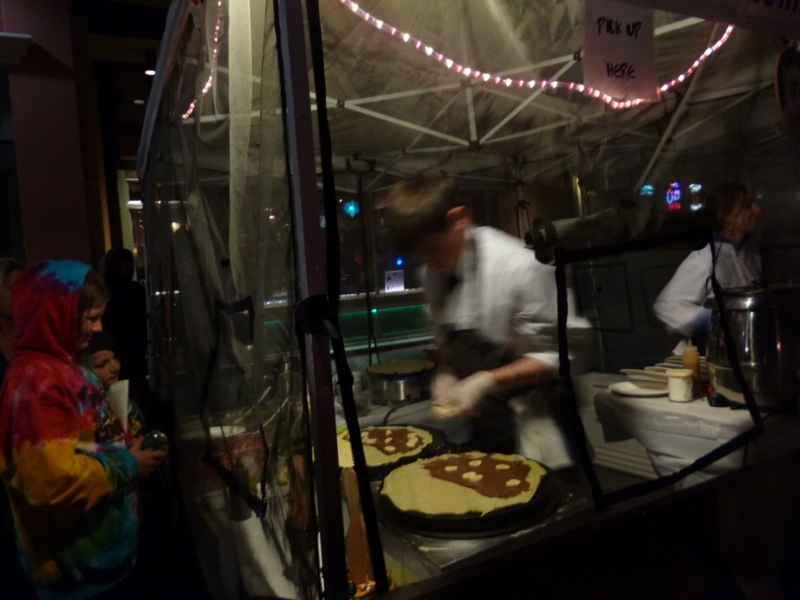 Even on a chilly February evening, the student energy helps light up the renowned Thursday night farmers market on Higueroa Street. We pass bales of kale and columns of cauliflower, but stop at the Cal Poly Dairy Science Department stall to sample and buy some student-crafted cheese for our train trip home. 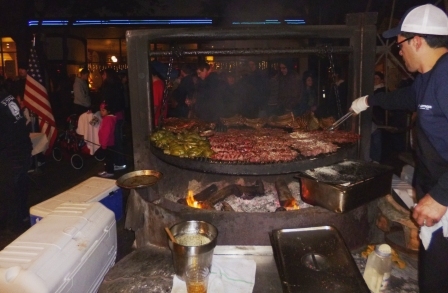 We taste some local micro-brew, watch as another student chef crafts giant Nutella crepes for a drooling kiddie clientale, and ogle the ribs on what may be the state’s largest barbecue grill – a circle of smoldering charcoal carpeted with ribs and chicken parts, at least ten feet across (the grill, not the chicken.) Town and Gown – what a wonderful blend, when SLO-cooked! visit you niece’s class in Spain?